Today, President Trump announced his intention to nominate Kelvin Droegemeier to be director of the White House Office of Science and Technology Policy. The office has been without a director for nearly 600 days, the longest vacancy by far since the position’s creation in 1976. The holder of the position traditionally doubles as the president’s science advisor and has often played a central role in shaping the nation’s science policy. Accordingly, the absence of a nominee has been a subject of intense interest since the early days of the administration. Droegemeier’s selection has drawn widespread praise from leading figures within the scientific community. A well-known meteorologist, he has spent his entire career at the University of Oklahoma (OU). He is currently the university’s vice president for research and has contributed extensively to science policy at the national, state, and professional levels. 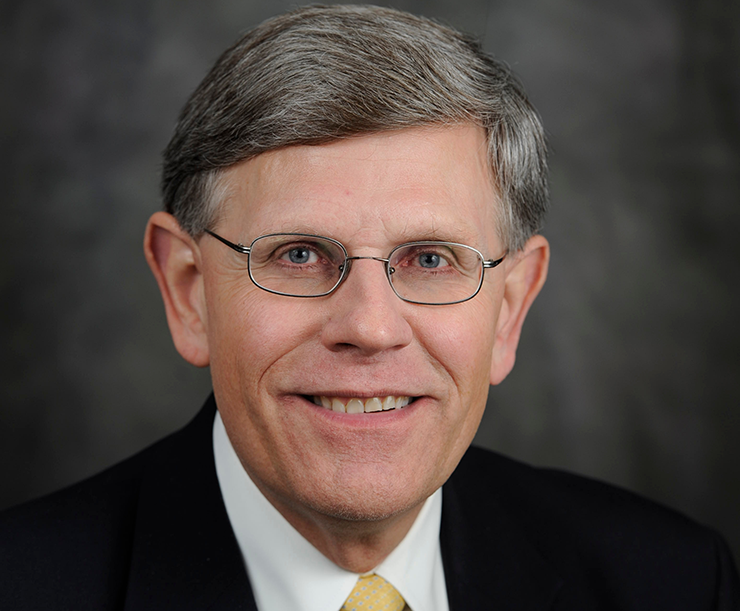 Droegemeier earned his bachelor’s degree in meteorology from OU in 1980 and went on to study atmospheric science at the University of Illinois, Urbana-Champaign, receiving his doctorate in 1985. He then returned to OU as a faculty member in the university’s school of meteorology. As a meteorologist, Droegemeier has focused on modeling and predicting severe storms. Throughout his career he has maintained a particularly close and enduring relationship with the National Science Foundation, which has supported many of his projects. With his colleague Doug Lilly, Droegemeier established OU’s Center for Analysis and Prediction of Storms in 1989 through NSF’s Science and Technology Center program, which the agency established in 1987. Droegemeier was the center’s director from 1994 to 2006. He was also a founder of OU’s Environmental Computing Applications System and its Center for Collaborative Adaptive Sensing of the Atmosphere, both funded by NSF. In 2004, President George W. Bush nominated Droegemeier to serve on NSF’s governing body, the National Science Board (NSB). President Obama extended his term in 2011, and he served as the board’s vice chair from 2012 to 2016. During his time on NSB, he chaired or co-chaired task forces on hurricane science and engineering, research cost sharing, mid-scale research facilities, STEM workforce characterization, and the troubled National Ecological Observatory Network. Through his deep and years-long connection to the National Science Foundation, we know him to be a thoughtful advocate for all aspects of science. … As a board member, he always did his homework, asking great questions, and providing NSF with valuable guidance on policy and strategy. 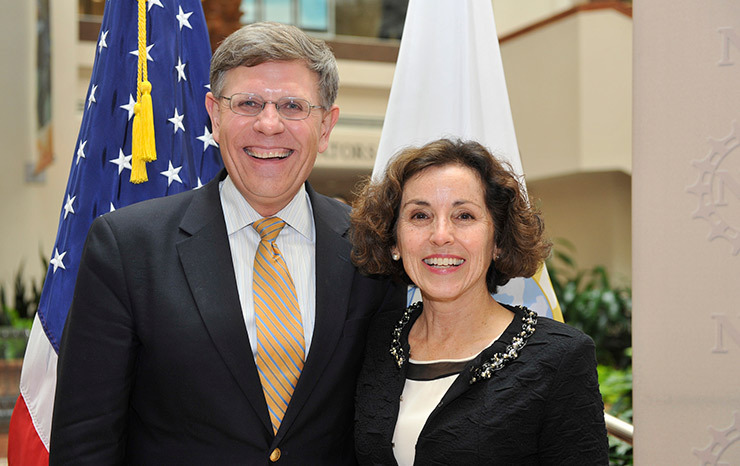 Kelvin Droegemeier and NSF Director France Córdova at her swearing-in ceremony in March 2014. Droegemeier has also been active in science policy at his home institution. OU named him its vice president for research in 2009. Since then, he has built up the university’s infrastructure for supporting scientific research and overseen the development of its research strategy roadmap. In 2011, Oklahoma Governor Mary Fallin (R) selected Droegemeier as a member of her new Science and Technology Council. In March 2017, Fallin named him the state’s secretary of science and technology, giving him responsibility over Oklahoma’s statewide science and technology strategy. Droegemeier has also appeared repeatedly before Congress as an expert witness at hearings and helped behind the scenes to shape legislation. In 2013, as the House Science Committee was developing legislation to modernize weather research programs, Droegemeier testified that weather and climate research should be viewed as “mutually reinforcing.” He remarked, “We would do well to consider weather and climate not as two distinct elements at the extreme ends of a spectrum, but rather as inseparable parts of the Earth system.” He worked with then-Rep. Jim Bridenstine (R-OK), who now leads NASA, to develop weather research provisions that were incorporated into the Weather Research and Forecasting Innovation Act enacted last year. Droegemeier also engaged with the Senate Commerce, Science, and Transportation Committee as it was working on the American Innovation and Competitiveness Act (AICA), a broad science policy bill that Congress passed in the waning days of the Obama administration. Sen. Cory Gardner (R-CO), one of AICA’s lead sponsors, became fond of invoking Droegemeier’s remark that the committee had “made science bipartisan again” with its collaborative approach to developing the legislation. In testimony to the committee in 2016, Droegemeier stressed the importance of federal funding for basic science and the growing significance of research that leverages multiple disciplines, highlighting how NSF-funded social science research has improved weather warnings. He also defended NSF’s grant-awarding procedures, which Republicans on the House Science Committee were seeking to modify through legislation. He urged Congress to instead focus on reducing administrative burden on researchers, citing NSB’s 2014 report on the subject that he helped produce. Droegemeier has also testified about the potential impacts of the Trump administration’s proposal to cap the National Institutes of Health’s indirect cost reimbursement rates at 10 percent of total research costs. At the request of Rep. Tom Cole (R-OK), the chair of the House appropriations subcommittee for NIH, he penned a 30-page report on the evolution of government–university cost sharing policies for facilities and administrative costs. Cole praised the document as “exceptional” and urged other members to read it. At a 2017 hearing Cole convened on the subject, Droegemeier warned that the proposed reimbursement change would fundamentally alter the government–university research partnership that was forged out of World War II and potentially lead to hundreds of universities having greatly diminished involvement in research. It remains unclear whether Droegemeier will receive the additional title of special assistant to the president for science and technology, which most prior OSTP directors have held. Given that President Trump, by all accounts, does not typically engage with policy details, Droegemeier’s status as science advisor may prove less important than his place in the White House’s broader policy apparatus. While OSTP will likely not become as large as it was during the Obama administration, the office plays a central role in formulating agency R&D budgets and integrating scientific and technological expertise into national policy and federal activities. Recently, OSTP has become particularly active in areas such as STEM education, quantum information science, and artificial intelligence. The White House also just released its annual R&D budget priorities memorandum, which OSTP produces in coordination with the Office of Management and Budget. In addition, an interagency panel on physical sciences research met for the first time during Trump's tenure on July 30 to discuss high energy physics, fusion energy, and low dose radiation research. 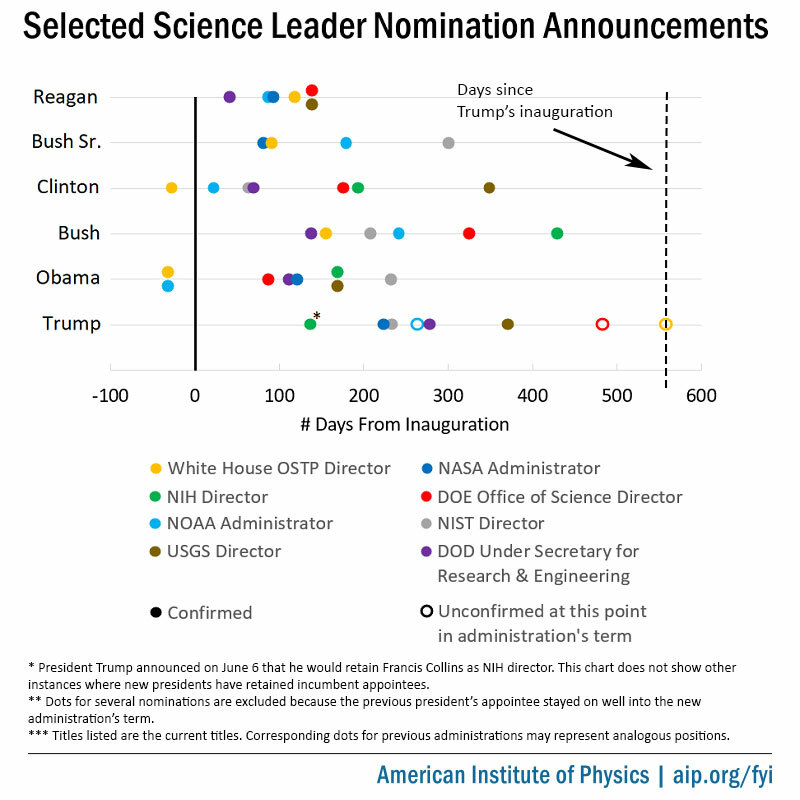 Meanwhile, the administration has nearly completed making its nominations for science leadership positions across federal agencies, and the Senate has moved quickly to advance all but a handful of them. Notably, though, aside from the director, several leadership positions within OSTP do remain vacant. Trump has also not yet named members of the President’s Council of Advisors on Science and Technology, a body of independent experts that does not require Senate confirmation, nor has he appointed replacements for eight NSB members whose terms recently expired. With Droegemeier’s nomination now in place, announcements on these positions could follow. The Senate Commerce, Science, and Transportation Committee, which has jurisdiction over OSTP, will be Droegemeier’s first stop on the path to confirmation. A spokeswoman for the committee majority told FYI that it “looks forward to considering the nomination soon.” Democratic committee leaders have not yet weighed in on the nomination, although several sent letters to Trump last year urging him to pick someone for the post. Sen. Jim Inhofe (R-OK), who is a member of the committee, applauded the nomination in a joint statement with Sen. James Lankford (R-OK). “From his time as a professor and service on the National Science Board to his leadership as the Vice President for Research at the University of Oklahoma, he has demonstrated a commitment to the scientific process, an appreciation for investing in research and a dedication to advancing technical achievement. I congratulate Kelvin on his nomination and look forward to his swift confirmation,” Inhofe wrote.